Quebec Winter Carnival 2019: The Ultimate Guide! Hoping to attend the Quebec Winter Carnival in 2019? See below for a full guide on how to make the most of the festivities! To innocent onlookers, Canada often takes on this magical aura of a snowy wonderland, where maple scented streets are filled with children shuffling around in neon-coloured onesies… where parents lovingly look on and sip hot double doubles, all while secretly checking hockey scores on their phones. And while often, I dispute such stereotypes with the fury of a hockey-crazed moose, I know there is a time and place where all Canadian stereotypes go to thrive, and it’s called the Quebec Winter Carnival. 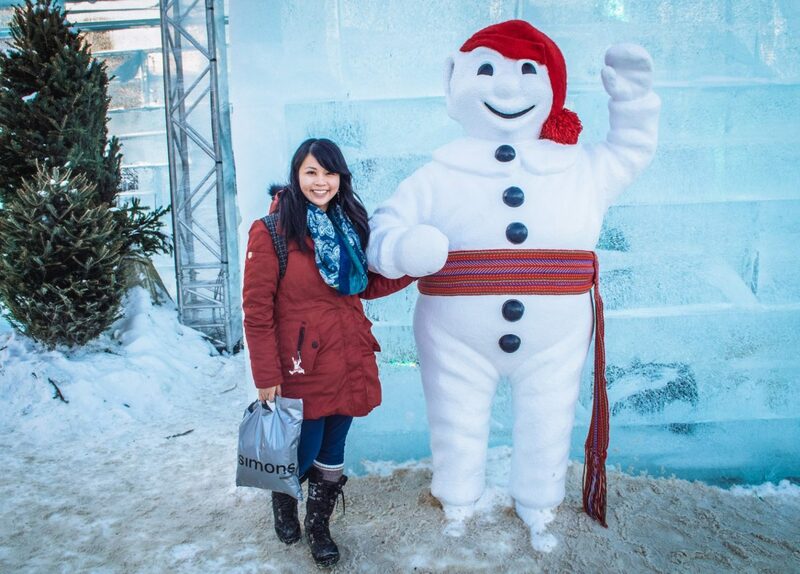 I’m talking maple syrup flowing like champagne, canoe races in icy rivers, freezing snow baths, entire castles made of ice, and of course: a permanently smiling snowman mascot known as Bonhomme (which translates to “Good Man”). Growing up attending a French school on the west coast of Canada (as far as possible from the actual festival site), every January of mine for 10 years was highlighted by the start day of Carnival. I’d put on my fluffiest coat, head outside my school and wait anxiously for Bonhomme to arrive on a bright red firetruck. … So okay, so maybe my school took some artistic liberty in adapting the traditions, but it was a big deal to me, okay? Fast forward 10 years later, I was finally able to make my Carnival dreams come true, visiting the actual festivities in January 2014. I never wrote about it until now. What’s that aboot, eh? Well, better late than never. 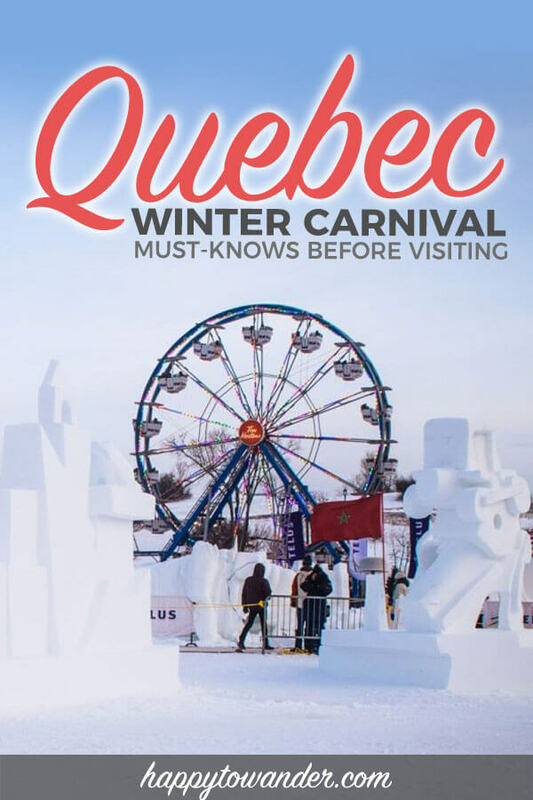 Armed with the most recent info (and some glitzy throwback pics), here is a 2019 guide to experiencing the oh so famous Quebec Winter Carnival, or if you wanna get Frenchy – the Carnaval de Québec. The Hilton Quebec: This is where I stayed during my visit and it was perfect – a super central location within walking distance to all points of interest and festival sites, plus excellent views. Because we booked early, we snagged a great deal too so I definitely would recommend staying here. Click here to check prices and availability. 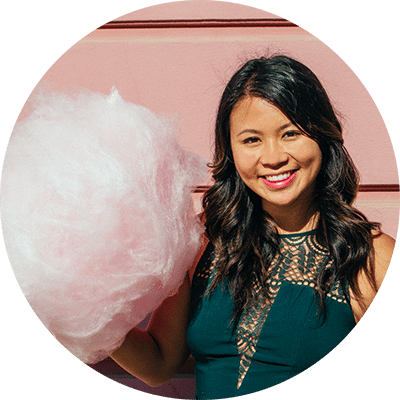 AirBNB: For something more cost-effective, AirBNB is a great choice. If you’ve never used it before, you’re in luck! Click here to get $40 off your first booking. 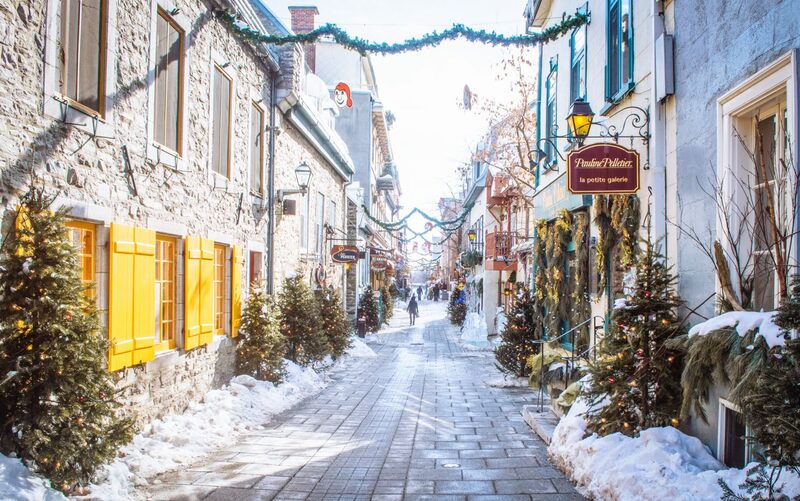 Widely recognized as one of the world’s largest winter festivals, the Québec Winter Carnival, or Carnaval de Québec, is an annual tradition that brings thousands of visitors together for French Canadian festivities. The first Quebec Winter Carnival was held in 1894. How did it all start? Well, supposedly, the festivities were inspired by the harsh winters of the area, with residents turning to creating fun celebrations to “warm their hearts during the cold season”. Held on and off for several years, the modern iteration of Carnival began in 1955 (alongside the introduction of Bonhomme!) It has since become one of the biggest events of the year in French Canada. So, you see, Carnival is a pretty big deal. When I had the chance to visit Québec during my university Reading Break, my childhood self was shaking in her parka. Sure, I’m overly excitable on the worst of days (I blame it on the maple syrup running through my veins), but this was next-level. Keep in mind, every Carnival period of my childhood (from Kindergarten to the end of high school) was spent playing Francophone games, belting out Quebecois folk songs and doing folk dances where I had to touch the hands of actual human boys (a groundbreaking development). I had been training for half my life to see this event! My first shocker… just a PSA for you all: Bonhomme talks. He has a voice. Pictured below was the exact moment I realized this guy had a human voice. Growing up, Bonhomme never spoke (probably because they never wanted to give away who was in the suit). Suffice to say, I was shooketh. What are the dates for the Quebec Winter Carnival in 2019? This year’s Quebec Winter Carnival will be taking place from February 8 to 17, 2019. Where is the Quebec Winter Carnival celebrated? Carnaval is a festival with various activities and events sprawled out across Québec City. The majority of activities are clustered in the main Festival site near Old Québec, but there are also separate events like balls, brunches and more that occur in various locations around town. During the festival period, the entire city is also decked out in pretty lights and ice sculptures, so there’s plenty of beauty to drool over. How much does it cost to attend the Quebec Winter Carnival? To enter the festival site, you have to purchase an effigy ($15), which is a cute lil (but very mandatory) trinket that you wear as proof that you paid the admission fee. The good news is, buying the effigy once gets you access to the festival site for the entire two weeks, plus it’s usually some kinda cute thing with Bonhomme involved, sooo… best souvenir ever. Fact: I still have my effigy on this bright red parka of mine, even 4 years later. You can purchase the effigy in-person or online here. With axe throwing and a mechanical moose involved, the better question might be “what isn’t there to do”. I can’t lie to you, I drooled a little bit while reading the events/program list for 2019. Maybe it’s me feeling homesick, maybe I just wish I could go back, but mmgh guys – there’s SO much to do this year. So many absurdly wonderful Canadian things! You can view a full program and schedule on the main website, but here are some to put on your list. NOTE: All of the info, dates and times below are based on the official Carnaval de Québec website. This original post has been amended to reflect the festivities for 2019, so I apologize if there are any outdated bits, but I’ve done my best to update everything! While roaming the site, keep your eyes peeled for festival mascot Bonhomme, a walking, talking snowman known for his trademark grin, sash and toque. Interestingly, I learned that there’s only one Bonhomme throughout the whole festival, which means spotting him can be rare. If you’re keen on getting a photo with him at some point, consult the festival schedule to see where he’ll be throughout the day. PS: In 2019 you can even go ice skating with Bonhomme at Carnaval! You can catch him at Place D’Youville on February 12 and 14. Admission is free (with rentals for a fee). Click here for more info. Can you see the absurd joy on my face? And this was just a statue! Obviously Bonhomme is a snowman who lives in style. 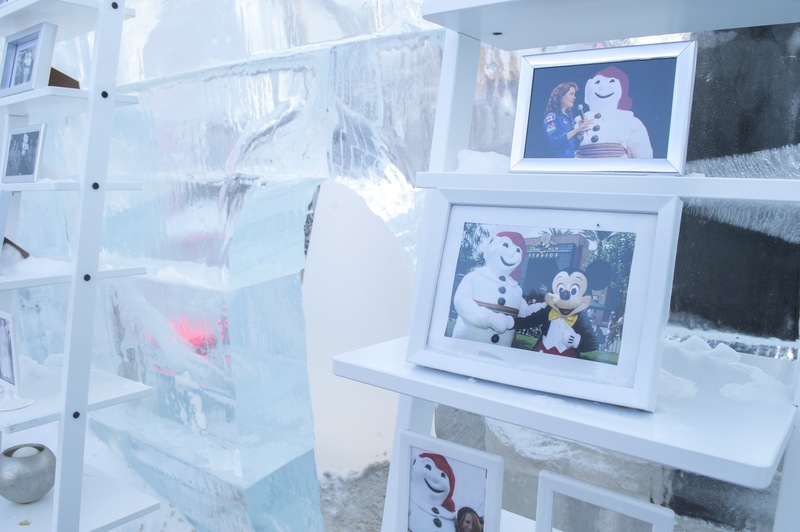 And while in previous years, he would live in an ice palace right across from the parliament building, this year you can find him in the re-imagined Loto-Québec Royal Court, complete with ice towers, a giant snow sculpture, photo booth and more. Here, you can meet Bonhomme himself, or even experience Bonhomme’s Dream, an interactive and immersive experience full of lights, projections and shadow puppets that happens day and night. Your true Canadian experience isn’t complete without a sweet taste of maple taffy, tire d’erable. People always think I’m joking when I tell them this, but no, I’m for real… Canadians actually eat boiled maple sap poured on snow. We call it maple taffy, and it’s actually a really cool experience because when it touches the snow, the sap instantly becomes a delicious soft candy that you can pick up with a popsicle stick or fork. Irresistible. One of the most iconic events of the entire Carnival period, and probably one of the most Canadian things ever. Apparently this is a tradition that has taken place since Carnaval’s first edition, and involves a lot of super strong athletes racing through a river studded with giant chunks of ice. It’s a little Titanic for my liking, but nonetheless one of the must-see events of the festival! In 2019, the annual Carnival canoe race will take place on Febraury 10 from 1-4pm on the St Lawrence River at the Louise Basin and 10 Quebec-City Ferry. In past years, seeing the mammouth snow sculptures of the International Snow Sculpture Contest was always a huge Carnaval highlight. This year, they seem to be placing the emphasis on ice sculptures instead, with awesome demos and a variety of cool activities at the Duproprio Ice Village. Be prepared to feel woefully inadequate. These guys can make epic things out of ICE and I’m here like, struggling to draw a triangle. Click here for more info. In 2019, there will be two night parades on February 9 and February 16 from 7-9pm along Grande Allée. While I never got to see one of these for myself, I’ve heard from multiple people that these things are larger than life, with tons of cool lit-up floats and a contagious buzz in the air. For 2019, they’re even advertising a completely renewed version of the parade with five scenes featuring different artistic disciplines with moving performances ft. circus/media arts, a rock show and even some pyrotechnics thrown in for good measure. Definitely put this event on your list of Carnavale things to do! NOTE: You need to register for this event beforehand and be 18+. Click here for more info. When attending Carnaval, it only makes sense that you carve out some time to party it up Canadian style, at an outdoor rave that’s free for all Quebec Winter Carnival Effigy owners! Sapporo EDM Evening will be taking place on February 15, 2019 starting at 6pm. This year’s set list includes six female DJs from around the world on rue Jacques-Parizeau, between rue de la Chevrotière and rue d’Artigny. Curling, ice slides, tobogganing, basically a laundry list of all the Canadian things you assume we don’t actually do…..
Guys, you can do them at Carnival. One of the funniest things I saw in the roundup was a life-sized human foosball game. They literally attach you to a pole in groups of three and kick a little ball around. Here is proof I am not joking. Canada, what even are you? Last but not least, there’s a variety of other events taking place throughout the Carnival period. These include parades, balls, special meals and more. Be sure to check the Carnaval website for a detailed list of what will be happening and when. So tell me, have you ever been to Carnavale de Québec? If so, what was your favourite part? It’s so much fun in spite of the snow. Hope you get to see for yourself someday!! We are heading up to Quebec tomorrow and were curious about the Carnival. After reading your post we will most definitely be checking it out! Much appreciated!